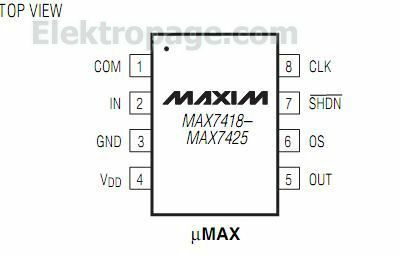 The MAX7418–MAX7425 5th-order, low-pass, switchedcapacitor filters (SCFs) operate from a single +5V (MAX7418–MAX7421) or +3V (MAX7422–MAX7425) supply. These devices draw only 3mA of supply current and allow corner frequencies from 1Hz to 45kHz, making them ideal for low-power post-DAC filtering and antialiasing applications. They feature a shutdown mode that reduces supply current to 0.2µA. Two clocking options are available: self-clocking (through the use of an external capacitor), or external clocking for tighter corner-frequency control. An offset adjust pin allows for adjustment of the DC output level. The MAX7418/MAX7422 deliver 53dB of stopband rejection and a sharp rolloff with a 1.6 transition ratio. The MAX7421/MAX7425 achieve a sharper rolloff with a 1.25 transition ratio while still providing 37dB of stopband rejection. The MAX7419/MAX7423 Bessel filters provide low overshoot and fast settling, and the MAX7420/MAX7424 Butterworth filters provide a maximally flat passband response. Their fixed response simplifies the design task of selecting a clock frequency.